April 12-18, 2009 is National Library Week, an annual celebration of libraries and librarians. This year's theme is "Worlds connect @ your library." Each year, a famous celebrity chairs the celebration. 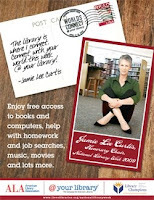 This year, New York Times best selling author and actress Jamie Lee Curtis is the Honorary Chair of National Library Week 2009. The American Library Association has created downloadable print and radio public service announcements (PSA), sample letters-to-editors, press releases, proclamations and more. For more information, contact NLW Campaign Coordinator Megan McFarlane.